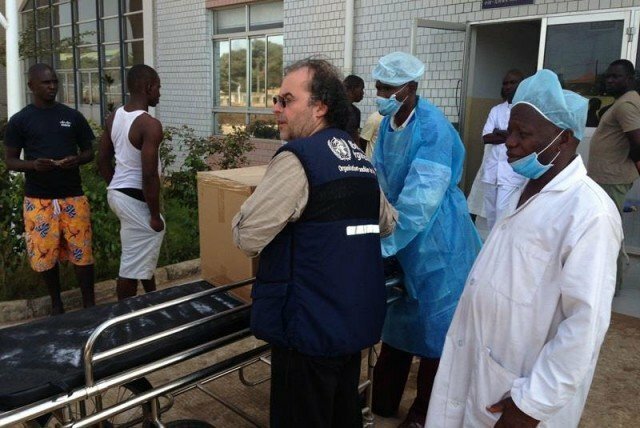 Guinean authorities searching for a team of health workers and journalists who went missing while trying to raise awareness of Ebola have found several bodies. A spokesman for Guinea’s government said the bodies included those of three journalists in the team. They went missing after being attacked on Tuesday, September 16, in a village near the southern city of Nzerekore. It is the world’s worst outbreak of the deadly disease, with officials warning that more than 20,000 people could ultimately be infected. The three doctors and three journalists disappeared after being pelted with stones by residents when they arrived in the village of Wome – near where the Ebola outbreak was first recorded. One of the journalists managed to escape and told reporters that she could hear the villagers looking for them while she was hiding. On Thursday night, government spokesman Albert Damantang Camara said eight bodies had been found, including those of three journalists. He said they had been recovered from the septic tank of a primary school in the village, adding that the victims had been “killed in cold blood by the villagers”. The reason for the killings is unclear, but correspondents say many people in the region distrust health officials and have refused to co-operate with authorities, fearing that a diagnosis means certain death. Last month, riots erupted in the area of Guinea where the health team went missing after rumors that medics who were disinfecting a market were contaminating people. Speaking on September 18, French President Francois Hollande said his country was setting up a military hospital in Guinea as part of his country’s efforts to support the West African nations affected by the outbreak. Francois Hollande said the hospital was a sign that France’s contribution was not just financial, adding that it would be in “the forests of Guinea, in the heart of the outbreak”. The World Health Organization (WHO) said on September 18 that more than 700 new cases of Ebola have emerged in West Africa in just a week, showing that the outbreak was accelerating. The WHO said there had been more than 5,300 cases in total and that half of those were recorded in the past three weeks. The Ebola epidemic has struck Liberia, Sierra Leone, Guinea, Nigeria and Senegal. A three-day lockdown is starting in Sierra Leone in a bid to stop the disease spreading.